Yesterday, decided to try out some exposure on the Abalone Surfline Cam by rigging up the Sealion for a few waves on the remaining surf from this week’s monsoon weather. Here is a short clip of a Surfline Rewind which features a little hit/float in conditions yesterday. Nothing extraordinary, but fun test of some surfline exposure in the surf on the Sealion. Now if we find a day with some more sizable action, could be interesting?! FUN Times on the Sealion Wings! A new AHD addition for 2016 is the introduction of the Sealion Wings. The Wings is a similar shape to the Pro model though with a further thinned rail line, reworked tail bottom and a bit more nose scoop. Though a key element of the Wings is the foil insert for flying over the water. Similar to past Sealion models, the Wings simply adds more aggressive capability to the light air wavesailing opportunities which equates to FUN on the water. I recently caught a near epic Fathers Day sesh down at Ramp 55 near the Hatteras Ferry Docks with low to mid teen range wind, sunny skies and long period head+ set wave super long line surf! The Wings was in its element and provided many epic wave ride scores throughout the session! Yesterday, I had the Wings out for International Surfing Day in Nags Head. Excellent and fun surfing conditions with no/minimal offshore wind. I prone surfed the Wings on this sesh, and again the board scored well for some fun long and aggressive rides! Next will be foil flying and I calmly await arrival of the foil for future summer ocean side flights when the surf is down but the wind/weather is ideal for flying above the water! Sealion Wings in action at Rmp 55 for Father’s Day! Bottom turn on the Wings and lining up! The foil box for the Sealion Wings – coming soon! 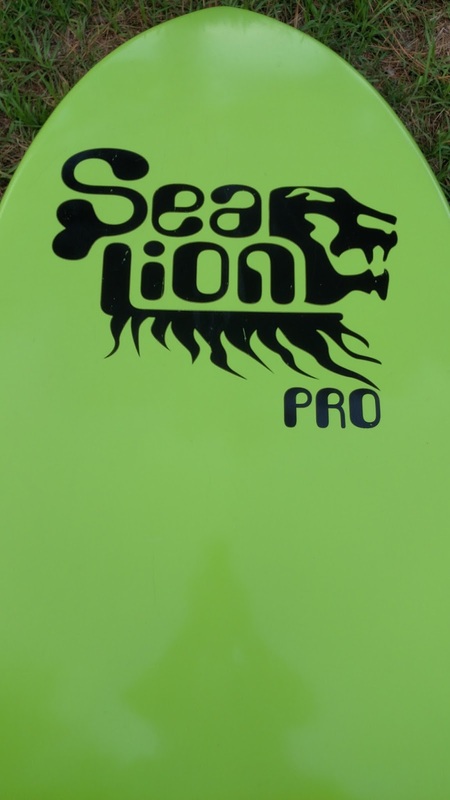 Check out the Sealion Pro for sale! 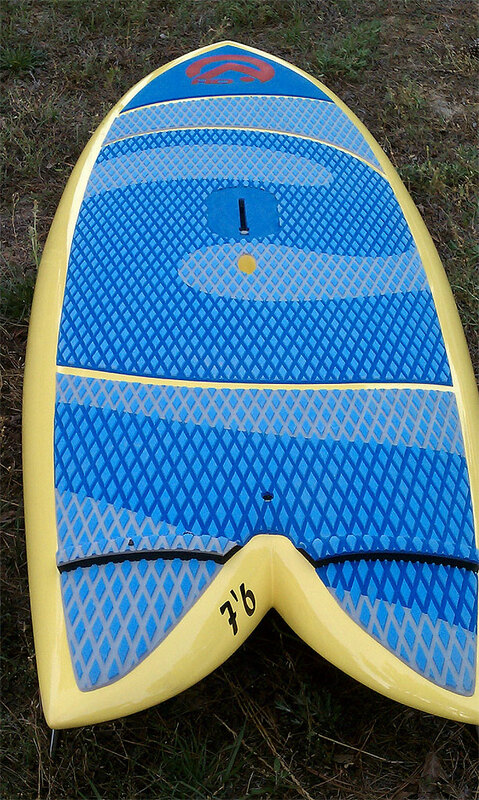 This rare light air wave ride guarantees FUN summer time surf sessions with a sail in hand! The Pro model offers a more aggressive ride over the Sealion Classic with a thinner rail line and 115 ltr of volume. 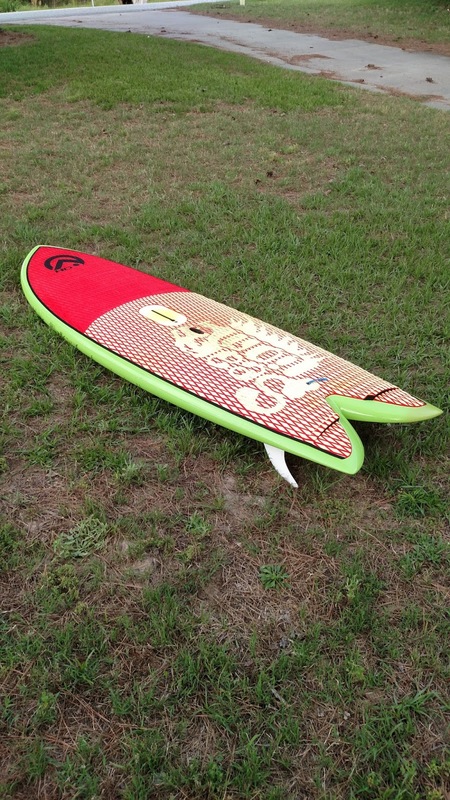 The board is an excellent choice for those looking to ride the surf of summer and always have that “insurance” option loaded for those weekend Hatteras runs or simply a window of time to catch a few waves! $ 890 – contact for details! The Sealion Wing is Coming! This summer I am looking forward to a new Sealion ride…, the Sealion Wing! The Wing is a lower volume (109ltr) aggressive design which offers top surfing performance. 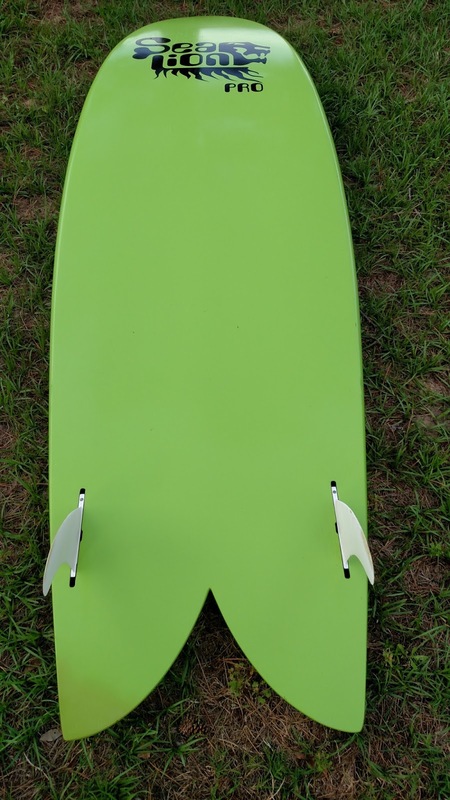 The Wing has same outline as the Pro model, however includes a thinner rail and redesigned tail end underside to improve performance and handling in the surf. The Wings also feature the option for a hydro-foil add-on for flying above the water; however, I will be sticking to the surf with the one I have incoming. Plus the new color options and graphics are pretty cool! Great news too is that we now have a local dealer for the AHD Sealion line. Wind-NC now carries Sealion’s and Andy will have a few 83s in stock at the shop, and can also take orders for future shipments! Thus, if you are an East Coast sailor interested in the Sealion, we now have have a regional dealer to get you onto a new Lion! One thing I really enjoy about the Sealion is its guarantee of time on the water. Yesterday, I had a busy work schedule and my son’s first T-ball game in the evening. Moderate wind and FUN surf was up in Nags Head, and I had to get a fix on the water. The Sealion was the answer with a quick 30 min session simply sitting in the surf zone where I caught at least 10 fun waves, plenty of turns and hits at the lip before heading out to the t-ball game. The Sealion is “Dad’s Ride” as it gives you time to get out for that quick fix session between busy work/life schedules. No more jonesing about lackluster wind as the Sealion gets you out there no matter what its blowing as long as there is surf on the sandbar! Looking forward to more “Dad’s Rides” coming soon! PS: also if interested in the Sealion Pro, I will likely have one for sale soon. Stay tuned for more in a future blog post! We are only a few days away from “official” summer time. June has been an excellent month so far for strong SSW winds near daily and follow though NE. Surf has been small to moderate depending on where you are at on the islands, yet overall it has been an excellent late spring season here. As we roll towards the heart of summer, the typical pattern usually includes light S/SSW afternoon sea breezes and continued small to moderate sized surf. Basically the perfect setup for side off light air wavesailing! The AHD Sealion is one of/if not the dominant option for aggressive wave riding style and activity. Below is an excellent promo video showing the Sealion in action in conditions typical to what we will see here this summer! Notice how it rides similar to a standard kit, though with about 20mph less wind! All in all, if interested in the Sealion, contact me via the upper left Sealion Rep box for more info, or to try one out! AHD has introduced a new SeaLion to its lineup called the 8’3.” This new lion has been coined the “pro” version of the XL offering a thinner rail line and slightly wider shape. From experience on the Pro, the thinner rail definitely helps with better control on the wave by reducing the bounce and offering a looser more responsive feel in the water. The 8’3″ will likely work well for those riders interested in the XL yet may want something a little more aggressive for activity in the surf or even Classic riders looking for something extra yet loose. Here in Hatteras, this model should work quite well for summer conditions during our light air side-off days with small to moderate surf size. May work well in bigger stuff too?! All in all, its great to see more choice for the SeaLion fleet and I know that I am looking forward to another excellent Hatteras summer season of waves and light wind, catching it on the Sealion. For me, its the Pro! In local windsurfing news, its been relatively mild here and there has been plenty of winter wave action southside from the Cape Hatteras Lighthouse to Hatteras Village. Rt 12 at Mirlo is now open and access south is good to go! Forecast right now looks like “balmy” winter warmth with mid-60 degree air temps though the foreseeable future! I have not been on the water for quite some time, but likely the Sealion will be reintroduced for 2013 to the Atlantic off Nags Head over the coming days. A little S wind to fill the sail, and I will be good to go! Down south, Wind-NC Andy has been hitting it regularly along with some of the local kite crew who did not jet off to some tropical destination. Killer Gear for Sale including Standard Sealion! Interested in the AHD SeaLion?! I have a used one for sale! The model for sale is the 2011 Standard Sealion (yellow) and is available for pickup in Nags Head. 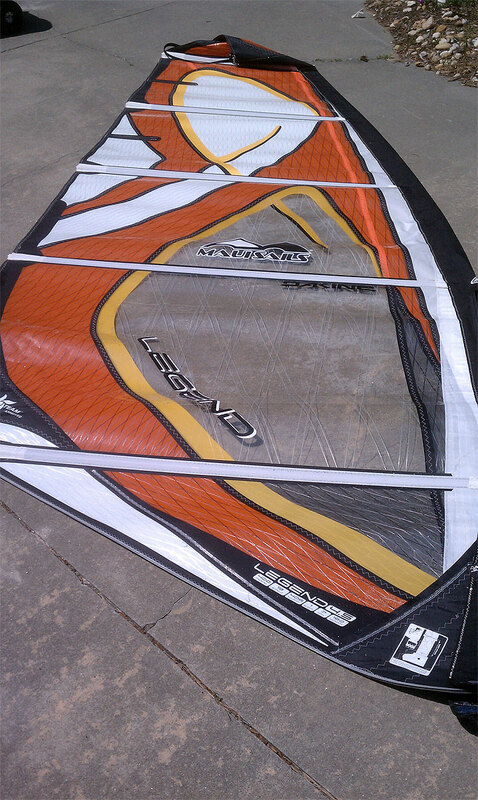 I also have a 2011 MauiSails Legend 4.5m, excellent condition. 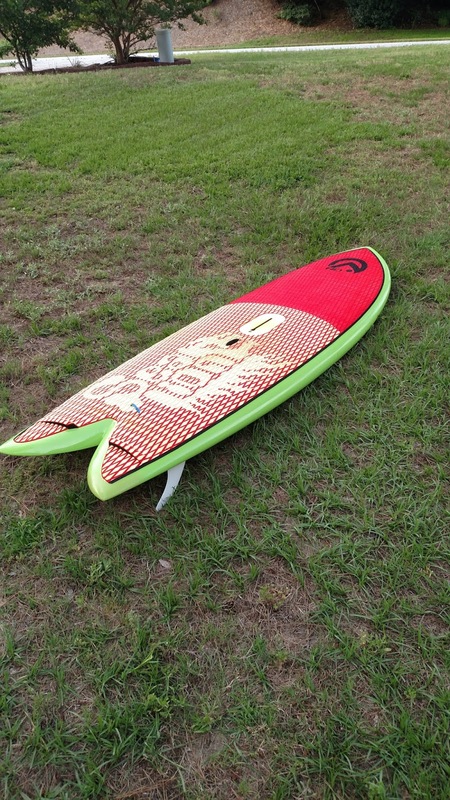 Additionally, 1999 Drops 8’8″ GOT wave stick, excellent condition. Includes foil board bag. Special Deal: Pick up the SeaLion and Legend (total: $ 1100.00), and take home the Drops GOT FREE! contact me if interested in any of the above sale items! Introducing the SeaLion PRO to Hatteras! 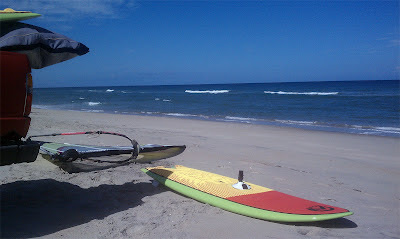 Yesterday I introduced the 2012 SeaLion PRO to Hatteras with a fun small surf session at Cape Point near the Cape Hatteras Lighthouse. Surf was quite small and short period which did not really offer optimal conditions to test the Pro’s surfability, but I did notice a definite difference from the Standard in that the Pro felt quite loose yet responsive, and is a definite step even closer to standard wavesailing characteristics on a light air board. The Pro has the exact same outline as the Standard however, volume is shaved from the overall rail thickness bringing it down to 115 ltrs. Weight is also reduced from the Standard which helps improve its responsiveness in the water. The Pro also comes stock with a smaller fin set at 16cm vs 18cm for the Standard. Overall, at my weight 155lbs, the Pro is the right choice for my true wave riding need in 5 to 18 mph wind. I am able to uphaul the board with no problems and stability is spot on for what I require while light air wavesailing in tune with the surf zone and inside. Upwind ability was excellent even in 5 mph wind. Fortunately, we should have building surf though the week as TS Florence churns closer to the US East Coast. If the winds remain light, I will definitely be ready to take the Pro into the tropical induced surf zone! Interested in the SeaLion?! I have SeaLions available for demo/rental as well as a new 2012 Standard SeaLion for sale. Price on the new 2012 Standard is $ 1195 with pickup in Nags Head. Contact me if interested in either the 2012 Standard purchase or a rental/demo available. Welcome late summer/early fall as the tropical season begins! Cheers to long period swell and surf generators which remain well offshore with no direct impacts.